- DateAdd - What's 2 months from today? - DateDiff - How long until loan paid? - DatePart - Is order from last quarter? - Display Ordinals: 1st, 2nd, 3rd, etc. Pre-Requisites: Access Expert Level 27 strongly recommended, as you should watch all of my classes in order. However, if you're skipping around, you should have at least completed the Beginner series and the first 3 or 4 levels of the Expert series where I start to cover functions. You should DEFINITELY watch Expert 27, as that's part 1 of the Date/Time functions and explains the fundamentals. We can use these functions to answer questions like is this date in the current year? Previous year? Current month? Year to date? We will use the WeekDay() function to determine what day of the week a particular date falls on (Sunday thru Saturday). We can then determine if this is a work day (M-F) or a weekend day (S,S). We will learn about the DateDiff() function which is used for finding the difference between two days, again in any interval you want. How many years are between two dates? How many weeks? How many whole months? How many weeks have there been since Jan 1st of the current year? We'll also learn about the optional First Day Of Week and First Week of Year parameters. The DatePart() function is like the functions we learned earlier for taking a date apart into it's various components, but it has a lot more flexibility. We can use DatePart for answering questions like "is a date in a specific month?" or "is this date in the previous quarter?" I'll show you a couple of formulas listed on Microsoft's site that may not give you correct values when dealing with weeks and the DatePart function, and my replacements for those. 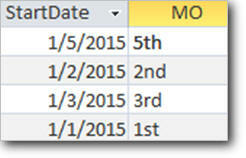 You will learn how to display Ordinal Dates, so if you want to say "Today is Monday, February 2nd" you can. You'll learn how to use nested IIF functions to determine how to write 1st, 2nd, 3rd, 4th, etc. Finally, you will learn how to generate a list of all of the birthdays (or anniversaries) coming up next month, so you can print out birthday cards in January for all of the February birthdays. We'll also talk about Table-Level Validation Rules, so you can make sure all of your order ship dates are later than the order dates. This is the 28th class in the Access Expert series. This is the fourth class in my Comprehensive Function Guide series, and part 2 of 2 classes on Date/Time Functions. If you're serious about building quality databases with Access, don't miss out on this course. Of course, if you have any questions about whether or not this class is for you, please contact me. What's Weekday if week starts on Monday? What Day of the Year is it? How Many Days Remaining in Year? Displaying 1st, 2nd, 3rd, 4th, etc.